LieToMe96 wrote: well mine only windows x32 so i can't open the alpha version, is there anything can i do for test? well mine only windows x32 so i can't open the alpha version, is there anything can i do for test? JaiOfHearts wrote: light blue is kinda hard on the eyes, can you turn it into the image of the back of the cards ? i mean no dissrespect. i was only giving in image idea. also nicely made keep up to good work. It's looking great, nice job! EDIT: I saved the deck. But when i select open deck, there isnt any option for me to choose my saved deck. hmm...Is there any "Decks" file in your dist folder after you saved the deck? I manage to get it to work. It seem really good, and its easy to use. I like the way it's done. I find that it is easy on the eyes. Great job eset the only things i see wrong are the few skill problems that hysterical mentioned. Its amazing, keep up the nice job ESET! It does seems to be a bit clunky but since this is the first 'Alpha' of the game, that's expected. Nothing wrong with your Alpha, although there's something wrong with the card database. Such as Queen of Hearts' skill is missing, and Vortex Dragon says "[AUTO]?VC?". Other than those mediocre errors, nothing's wrong. If something breaks tell me how you broke it- Thanks. Cardfight Capital has been taken down thanks to bushiroad, which is why this game is being created, since you didn't take the time to look. And i agree with Raikou, asking when the game is going to finish is both rude and disrespectful. In case you aren't aware, programing of any kind takes a LONG time, so be patient. It will be out when it's ready. light blue is kinda hard on the eyes, can you turn it into the image of the back of the cards ? I have tested that this does indeed work on other people's computer's. 3 others have this working for them. 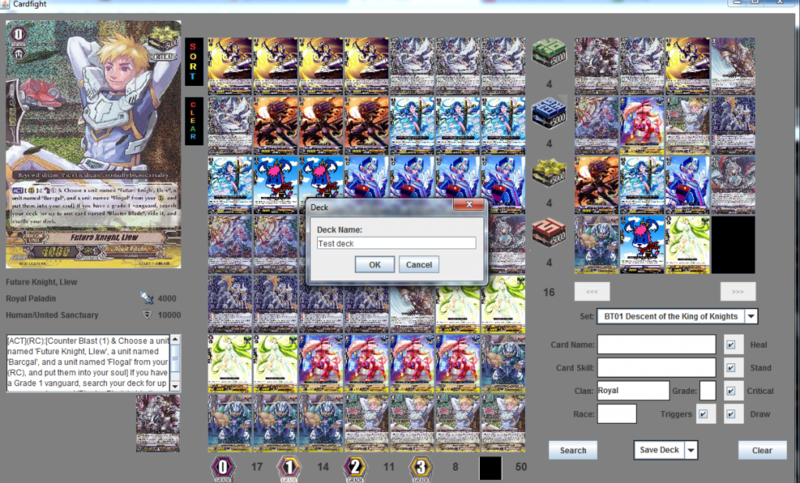 all the buttons work, sort deck, clear deck, next page and previous page, search and clear all works..